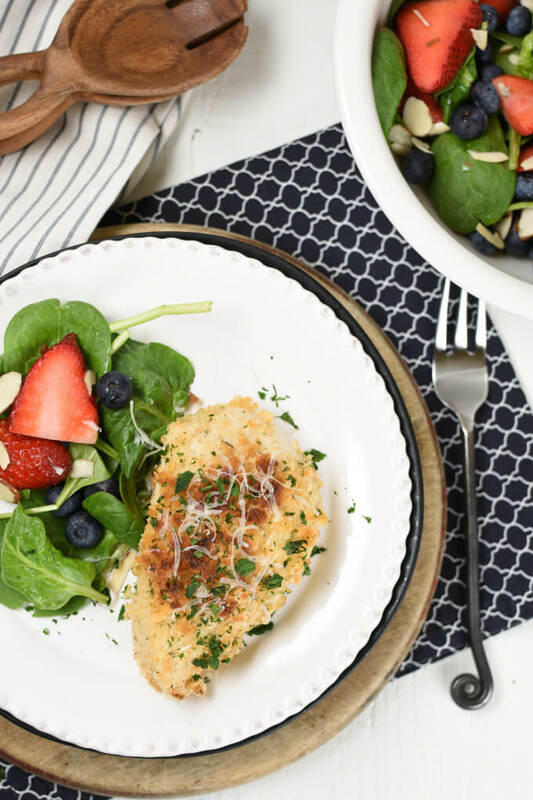 Melt in your mouth Ritz Parmesan Baked Chicken is every bit as moist as fried chicken, but it’s as easy as baking it right in the oven! Using Ritz, or any other butter cracker, and parmesan cheese creates a to crispy golden brown crust as it bakes while Greek yogurt locks all the juices in! 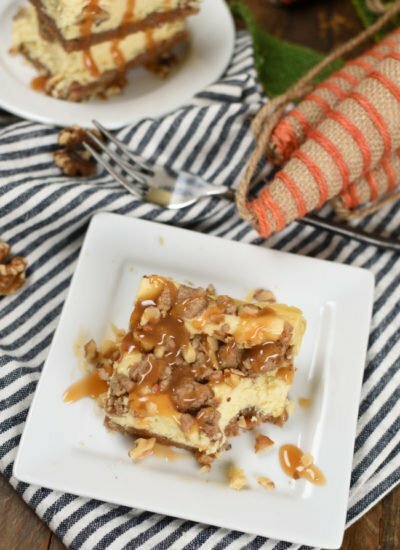 Want more scrumtious recipes? Be sure to sign up for my email subscription and I’ll send them rigth to your inbox! My feelings about baked chicken! You guys, this is the first baked chicken recipe I’ve added to this blog. To be honest, we don’t eat chicken very often. 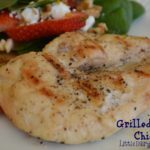 When we do we almost always use My Best 3 Ingredient Grilled Chicken recipe. Baked chicken usually seems rubbery and dry to me…not with this chicken though! When I tell you this chicken recipe is completely melt in your mouth, ultra moist, and has spot on flavors that’s really saying something. Because my family isn’t the biggest baked chicken fans in the world! They gobbled this one right up! This one is a must try chicken recipe! Planning meals with reduced carbs. I want to know if you serve a starch as a side dish for almost every meal? We’ve been trying to limit our carbs a bit and it’s a huge adjustment for me. 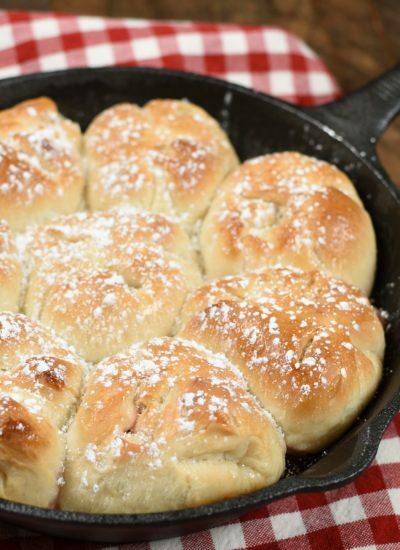 I’m used to adding Loaded Crash Potatoes, Three Cheese Mashed Potatoes, Simple Parmesan, Spinach, and Lemon Orzo, or Easy Parmesan & Garlic Dinner Rolls to every single meal. It’s the good stuff! Vegetables are actually on of my favorite foods and they are typically included in every meal. Vegetables AND carbs. Not just vegetables. I’m having a hard time getting used to doubling up on the veggies and skipping the starches. 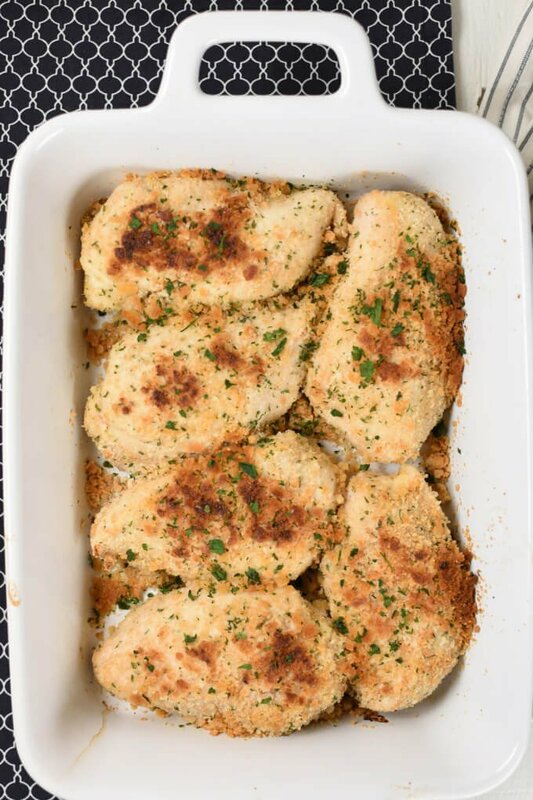 I know Ritz Parmesan Baked Chicken isn’t 100% keto friendly or carb free, but it’s close (I think) and that’s good enough for me! 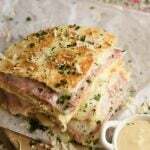 It’s completely scrumptious served with a cripsy green salad! With this recipe I didn’t really even miss those taters…at least not too bad! 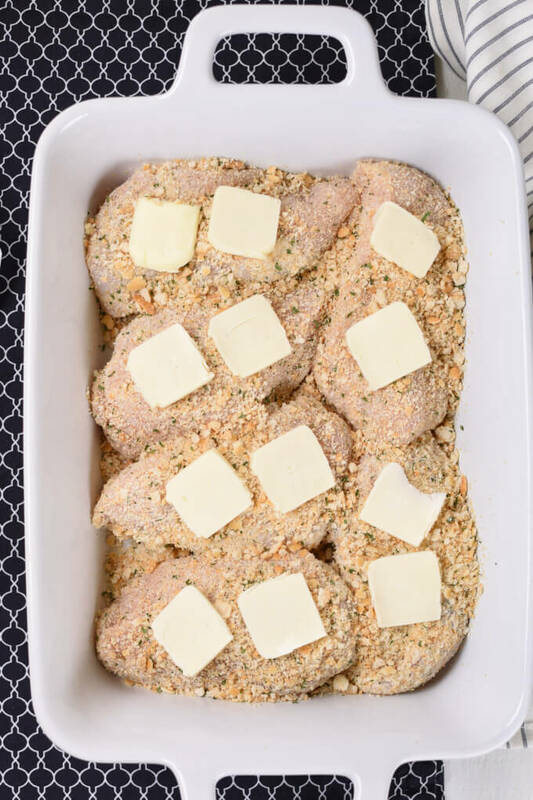 How do I make ultra moist baked chicken? The secret to keeping the chicken ultra moist in this recipe is plain Greek yogurt. Generously coat each chicken breast with plain Greek yogurt. There are two benefits from doing this. First, it will help tenderize the chicken breasts. I don’t know the science as to why, I heard it somewhere and it works! Second, it helps seal all those juices inside as the chicken bakes. It’s magic! How do I get a crispy crust on baked chicken? After coating chicken in Greek yogurt, roll it in crushed Ritz crackers mixed with Parmesan cheese and parsley flakes and spices. Yes, you can use any other brand of buttery crackers. Or you can be adventerous and use any kind of cracker. Goldfish? I bet it would be tasty! The next step is important! Set a slice of butter on each chicken breast! It will help create the most amazingly golden brown, and crispy crust ever! You can’t ever go wrong with butter! 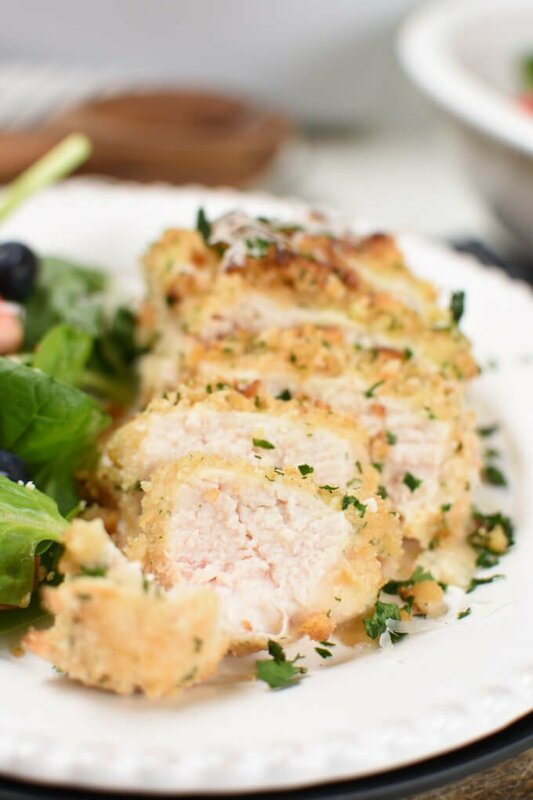 What to serve with Ritz Parmesan Baked Chicken? 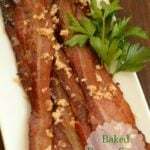 Well, like I said ealier I have a whole blog full of carb lovers side dishes to serve with this main dish! In the spirit of trying to limit that carby goodness here’s a few healthier, or at least less carby sides! 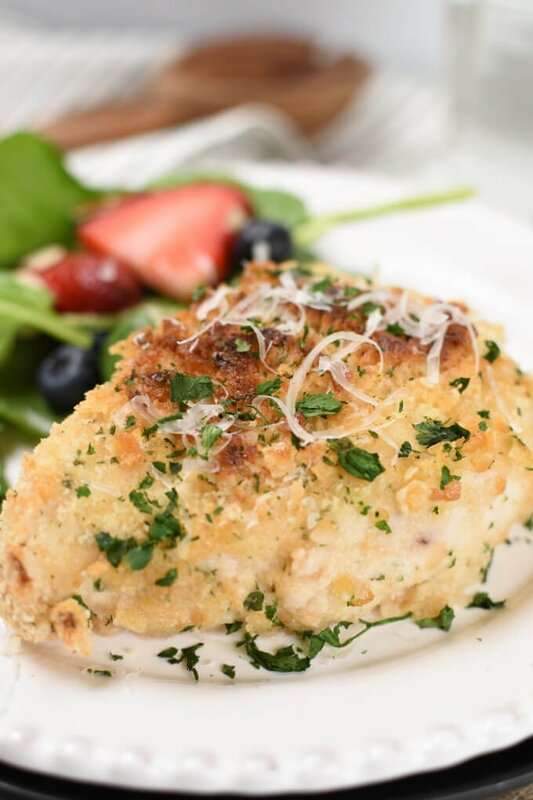 Grab the Ritz Parmesan Baked Chicken Recipe! 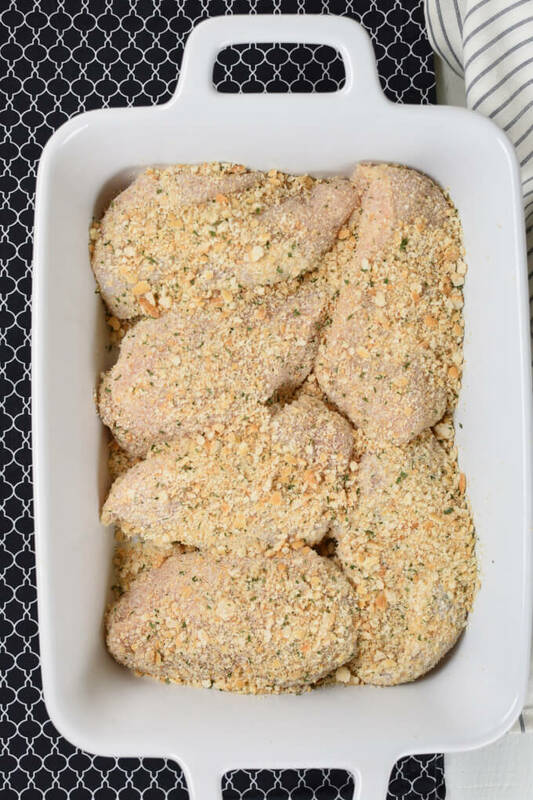 This baked chicken breast recipe is definitely one to add to your rotation of favorite easy main dishes! Even my “non-chicken lovers” devoured this chicken! 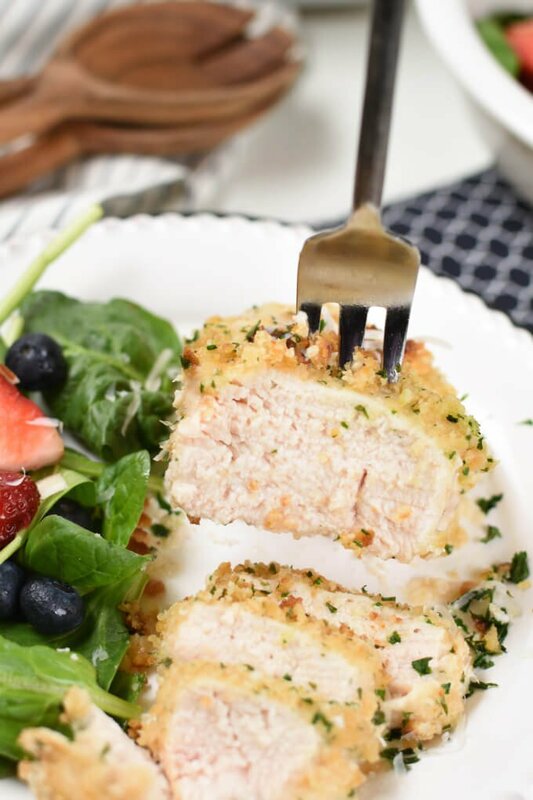 Melt in your mouth Ritz Parmesan Baked Chicken is every bit as moist as fried chicken, but it’s as easy as baking right in the oven! Using Ritz, or any other butter cracker, and parmesan cheese creates a to crispy golden brown crust as it bakes! Preheat oven to 350 degrees. Prepare a 9″ x 13″ baking dish by spraying with non stick baking spray. Add cracker crumbs, garlic salt, seasoned salt, parsley flakes and 3 Tbsp. Parmesan cheese in a shallow dish and mix. Coat each side of chicken breast with plain Greek yogurt. Then roll in cracker mixture until completely coated. 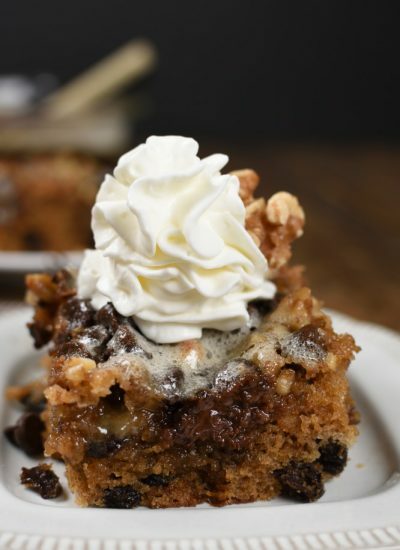 Set in a single layer in prepared baking dish. Slice butter into 16 equal slices. Add two slices to the top of each chicken breast. Bake uncovered for 45 minutes. Check chicken after 30 minutes of baking. If it’s completely browned cover with aluminum foil for the remainder of baking time. 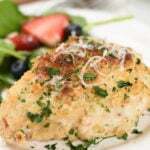 If desired sprinkle additional grated Parmesan cheese and chopped parsley over chicken before serving. 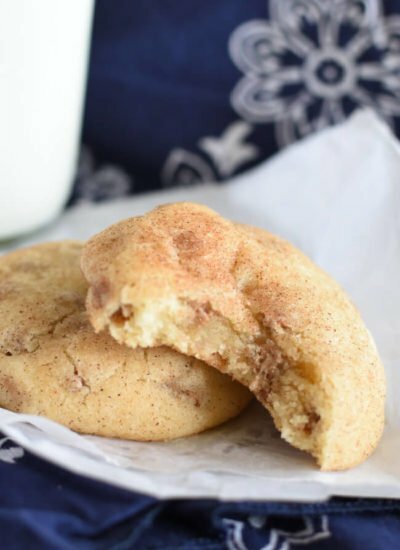 This sounds like it would be delicious .how can I convert the recipe to the air fryer? Hi Marshall! 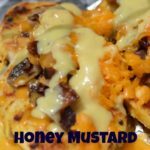 I haven’t ever used the air fryer to make this recipe. From what I’ve read you can cook them at 390 degrees for 4 minutes, flip and cook for 2 more minutes. Exact time will vary slightly depending on thickness of the chicken breasts. It would be best to cut one in half and check for doneness. Let me know how it works! Yep! I always make a little extra for adding to my salad for lunch the next day! This will be a huge hit with the kids! Yes! You could practically convince the kids it’s like eating a massive chicken nugget, except this chicken is so delicious even the adults will go crazy for it! Oh wow, this chicken parmesan sounds incredible!! I love using ritz crackers!! YUM!! Sometimes chicken seems dry and bland, not with this chicken though! It’s so flavorful! The easiest and the tastiest dinner ever! I love everything chicken! Easy dinners are the ones that show up on the menu over and over again! This chicke is a staple! So much fun to add Ritz to the breading for the chicken. This looks so moist and flavorful!! Those buttery crackers add the perfect crispiness to the chicken, and they help lock all the juices in! This is one chicken dish I have to try! This chicken is so incredibly juicy on the inside and crispy on the outside! It’s exactly as chicken should be! This looks like a wonderful dinner and it looks like it comes together quickly! Mmmmm, I can’t wait to give it a try.